TV COVERAGE: ESPN2 - Rumor has it even Erin Andrews will be there. Watch out for photoshoppers! LINE - Iowa is a 5.5 point dog on a neutral court. The winner of this matchup has a very good shot at doing well in this tournament. Being on the 2 and 3 seed side is a huge benefit when neither of those seeds are the MSU Spartans. The 7/10 hole has been productive in the past in this tourney, as well, so history is behind it. 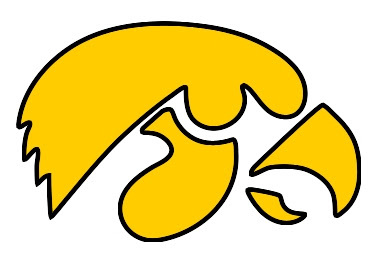 I have never liked how Iowa matches up with UM. Harris and Sims are two of the more talented and athletics guys in the Big Ten. However, if Tate can get his ankle shored up after that amazing one-legged performance last time out vs. PSU, Iowa will stick with the Wolves. Iowa has been in almost every game this year, and with Jake Kelly at the point, the Hawks are much more explosive. I really enjoy watching Jake run the show, he can create a lot of opportunities for Iowa when he has the rock. I also love see both Tate and Cole out there at the same time - what a missed opportuniy that was this year! This game really could go either way. I think the point spread is a bit high, but Lickliter has had his trouble beaten Beilein in the past. TODAY'S PROJECTED HAWKEYE KILLER: Manny Harris. Jake destroyed him last time out. And although the Big Ten doesn't recognize it, Kelly is one of the best defenders in the Big Ten. Jake shut him down last time out and (reportedly) forced Beilein to bench his star player in the overtime session. I think Manny is out for redemption in this one.